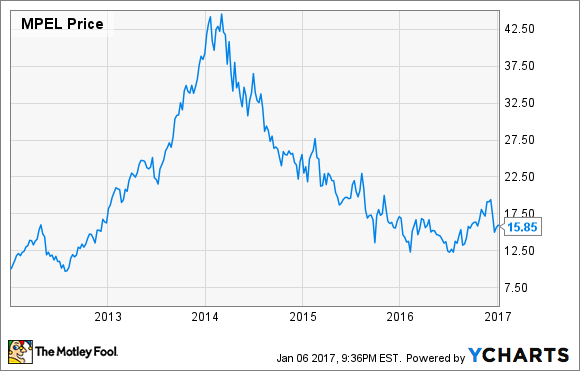 Melco Crown Stock Performance: Is This Macau Casino Company Worth a Bet? The Macau-focused entertainment and casino company has had a rocky performance over the past few years. Here's an analysis of Melco Crown stock and where it could go from here. Melco Crown (NASDAQ:MLCO) stock had an impressive run in the second half of 2016, mostly thanks to a regrowing gambling market in Macau and the company's new entertainment-focused casino that opened there in July. The company has also beat earnings expectations, partially because of the market and the new casino in Macau, as well as a timely share repurchase program. Here's an analysis of Melco Crown stock, and what this casino company's performance could look like going forward. Melco Crown's newest Macau resort is called Studio City. Image source: Melco Crown. Melco Crown's stock, like that of its key competitors in Macau, Wynn Resorts (NASDAQ:WYNN), Las Vegas Sands (NYSE:LVS), and MGM Resorts International (NYSE:MGM), has had a remarkably volatile past few years. Following Macau's booming market up until 2014, each company saw quarter after quarter of expanding profits, which sent their stock prices soaring. However, once the Chinese government decided to implement new regulations in the summer of 2014 that restricted travel to Macau and limited the amount that VIP gamblers could spend there, the industry entered a major downturn. Over the next two years, gambling revenue in Macau kept dropping compared with the same month in the prior year. Macau makes up nearly all of Melco Crown's revenue, so its stock was one of the worst-performing during the crash. However, starting in the second half of 2016, fortunes for Macau and these companies started to turn positive. December 2016 was the fifth month in a row of year-over-year gains in monthly gross gambling revenue in Macau, and Melco Crown saw a sizable uptick in share price from its mid-2016 lows. However, Melco Crown is also the least diversified gambling company in Macau, and the most susceptible to continued volatility there. As can been seen at the end of 2016, Melco Crown's stock price dipped once again on news that the Chinese government was considering a limit on ATM withdrawals in Macau. Even though the policy turned out to be less restrictive than expected, the stock has still remained depressed, perhaps because investors now believe that the Macau rally could easily be stopped by increased regulation once again. The Chinese government has said that part of its goal in implementing regulation was to turn Macau into an all-inclusive entertainment destination, focused on more than just gambling. Melco Crown's new resort Studio City, which opened in October 2015, hopes to be just that. This Hollywood-themed resort has 1,600 rooms and offers plenty of non-gambling entertainment options such as a plethora of restaurants, bars, clubs, shopping, a 427-foot Ferris wheel, and multiple theaters. Melco Crown's Studio City opened in October 2015. Image source: Melco Crown. The draw of this new resort from an investing standpoint is that it's meant to attract mass-market travelers more than VIP gamblers, which seems to be the future of growth in Macau as the Chinese government continues to seek ways to make Macau even less focused on VIP gambling. Of course, Studio City isn't the only new casino to open in Macau. Both Las Vegas Sands and Wynn Resorts opened casinos there by the end of 2016, and MGM Resorts is working on its own resort, which is expected to open mid-2017. These new resorts are also hoping to attract mass-market and non-gambling market. Melco Crown has been able to beat earnings expectations multiple times in recent quarters. In the most recently reported quarter, it posted sales up 22%, year over year, and earnings of $0.04 per share, double the prior-year quarter. The strong quarter was attributed to Studio City's success, as well as growth at the company's resort in the Philippines, though those operations make up only about 11% of total revenue. Additionally, a share buyback program started in May 2015 has reduced share count by about 10%, helping drive earnings per share slightly higher. Regardless of stronger-than-expected earnings growth, Melco Crown stock still looks expensive based on price-to-earnings ratios. Even though the company has been able to grow earnings while its stock is still priced at a nearly all-time low, its P/E remains an industry high. As of the start of 2017, here's how Melco Crown stock stacks up to its competitors. P/E = price to earnings, TTM = trailing 12 months. B = billion. Data source: Yahoo! Finance, as of Jan. 6, 2017. While Melco Crown's new resort could help the company to continue to gain on Macau's shift toward the mass market, especially if the economy there continues to turn around in 2017, and growth in the Philippines is a welcome diversification, there look to be better bets in the gambling industry now. Melco Crown is still almost solely dependent on revenue in Macau, which could be dangerous in the case of increased regulation, and its stock still looks expensive compared with its competitors, which are also beginning to perform well thanks to renewed growth in Macau, as well as their other markets such as Las Vegas.